Anyone have pictures or diagrams of heater hose routing, with control valve (AC car) for 351C? all help appreciated. i can show you how i ran mine, the ford shop manual isn't a great help. If you have a different intake and air cleaner base things will get in the way also. ok the heater core has 2 connections, looking from the front of the car to the firewall i will call it left and right. left is towards the shock tower, and right is towards the engine. off the right connection you will need a small piece of S shaped hose. connect one end into the heater core, bring the other up behind the motor, and connect the control valve to it. now one heater hose is molded with a L the other is straight. depending on how your intake and air cleaner base and alternator all sit, you may have to juggle things around, basically the L shape goes into the water pump, and the other hose which is straight can go either way. which port you use doesn't matter it will depend on how everything sits so mock things up first then cut until your happy with how everything fits. 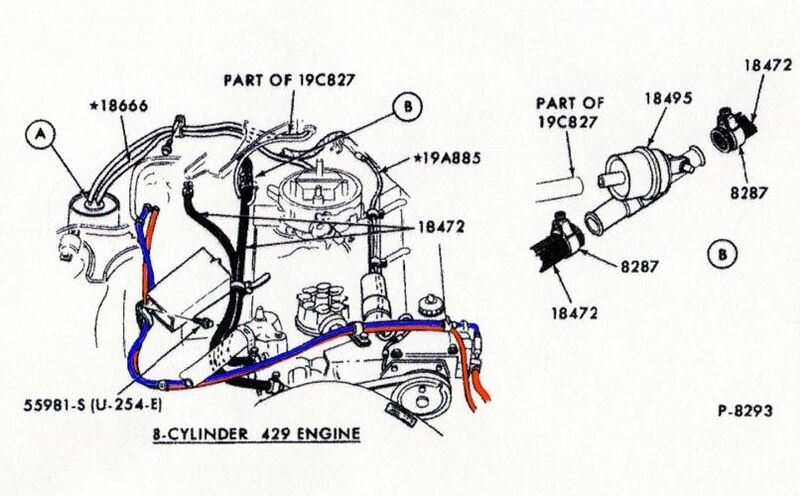 the manual wants you to run both hoses over the motor on the left side underneath the air cleaner base. between the heat riser. this isn't practical because of all the changes to the car over the years. I ran my heater control valve hose (one hose) over the engine between the air base and the heat riser. The other hose i let go around the side of the engine by the shock tower following the A/C hoses to make things easier to service because i was taking the air cleaner base on and off the car all the time. it looks fairly neat. once you change the intake and the carb from OEM, the spacing gets REALLY tight running both hoses there causes issues. i also have my fuel line coming up in that area to get to my Holley DP and having both hoses there would of caused a problem with that also. tonight i'll see if i have some pictures of my car. one word of caution with the molded hoses from any vendor, I've noticed they can be defective. i had a set of heater hoses with the yellow stripe and on the side of the hose is a ribbed area to make them look concourse correct, i found them to have Pin hole leaks from that area. I had to change heater hoses 2 times before i received a set that was not defective. I've learned that that type of hose from 'Marti' are made in a mold to match OEM and they can be defective. so if you change hoses and see coolant under the car, run your hand to the lowest part of the heater hose and if its wet change the entire hose its defective. (12-02-2010, 09:39 AM)72HCODE Wrote: i can show you how i ran mine, the ford shop manual isn't a great help. Thank you for the information. The pictures will be great. The assembly manual wasn't of much help. It doesn't show the vacuum actuated heater control valve at all and it shows the "inlet" to be on the outboard side and the "outlet" to be on the inboard side. Its been shown not to matter how the heater box is hooked up to the water pump so long as the valve closes off one side of the feed to the water pump it basically turns the heater core off. on earlier cars before 1970 there is suppose to be a difference because of a restrictor used before the heater core to prevent a pressure build up inside the core which can cause the heatercore to actually blow up. so in that case with the hipo engines you needed to make sure the connection was correct. on 71-73 is does not seem to mater. (12-02-2010, 03:49 PM)72HCODE Wrote: Its been shown not to matter how the heater box is hooked up to the water pump so long as the valve closes off one side of the feed to the water pump it basically turns the heater core off. went through the pics on my harddrive and never really took a picture of the area completed, it will be difficult to get a shot because the shock tower braces, and aircleaner and my carb are all blocking the views. i'll make a drawing of where my L hose is so you can get an idea when you mock yours up. (12-02-2010, 11:02 PM)72HCODE Wrote: went through the pics on my harddrive and never really took a picture of the area completed, it will be difficult to get a shot because the shock tower braces, and aircleaner and my carb are all blocking the views. i'll make a drawing of where my L hose is so you can get an idea when you mock yours up.